First one, then two, and now three persons are being interviewed - another first! I was able to get Russ, Rand and Lee, the guys behind Trail Designs, to sit down and answer my questions for an interview like you haven't read before. Take your morning coffee and read how the Caldera Cone was born, which other gear they like, and what SUL projects you can expect in the future from them! 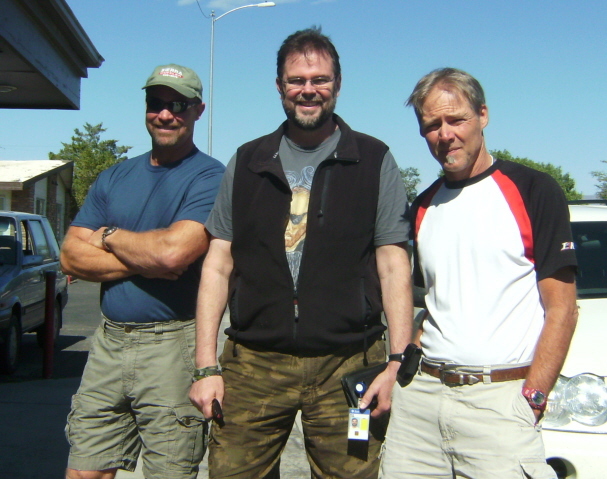 All three Trail Designs guys on their way to Summer OR 2009. Lee, Rand and Russ, from left to right. Please briefly introduce yourself and tell us who you are and what your role at Trail Designs is. Since when are you backpacking, and how did you start? How often are you out backpacking nowadays? Russ: My name is Russ Zandbergen. I have 3 kids, 10 year old twin boys, and a 14 year old daughter. Being a single parent and being part of a growing small business keeps me busy, the way I like it. My kids are starting to get involved in camping and Trail Designs. I have 2 degrees, 1st in business, the 2nd in mechanical engineering. I am a Professional Engineer (PE) in the state of California. Lee (our other partner) is my brother. He and I grew up in Los Angles, living in apartments in Santa Monica and west LA. Through a connectionI made, I was offered a job as a mechanic in a raisin packing plant in the central valley (Selma CA). I had no experience, but was able to learn welding from the 2 other full time maintenance guys, something I Love to do to this day. I paid my way through business school as a fabrication welder. It didn't take me long to figure out that I was more of an Engineer than a business guy...... landed back in school, came out a Mechanical Engineer (ME) and again through connections ended up designing instrument enclosures for Hewlett Packard. I like creating. I was employed designing computer enclosure for the next 20+ years. I did a lot of construction and engineering on the side during those years. Actually Rand and I first started hanging out when he would show up for work days when I was building an addition on to my house (he wanted to learn more about construction). I was part of a "Reduction In Force" at Sun Microsystems just over a year ago. I'm happy to be out of the computer business and enjoying life a lot more these days ! I try and do the trips Lee organizes that are mostly cross country, and one longer solo trail hike per year. I do what I call "local adventures" almost every week. I do local training hikes in the hills east of San Jose where I live, and always bring a Caldera stove system to run in real life conditions. My primary function @ Trail Designs is to invent and engineer new products. Like Lee and Rand we all wear a lot of different hats - including production. Lee: Lee Here. I have had basically two careers. Concrete finisher and Manufacturing Engineer. For Trail Designs, I stay out of the spot light in my machine shop at home making custom tools to produce the Caldera cone. I'm self taught in my Manufacturing engineering career and pretty much everything else as I started ditching school to hike in the foothills near LA at the age 14. I did a few backpacking trips at age 14 in the coast range near Malibu Ca with a really painful wood frame pack but didn't get started for real until I moved into the Central Valley near the Sierra's at 21. Now I get to do 2 or 3 cross country trips and few trail hikes per year. Lee's machine shop in Modesto. Last summer. Are you three all lightweight/ UL backpackers? If so, what is your typical baseweight? Rand: I don't tend to chase the 5lb skin out weight crowd but I do like to keep my base weight well below the average backpacker. Being 6'6" tall, my general gear tends to be heavier than most with larger clothes, larger tent, larger sleeping systems, etc. However, I do run below 15lbs including the required bear canister. Russ: I don't have a typical base weight. For me almost every trip is an experiment. One of my quests is to have a sleeping system that works on the ground and also works in the air ( Hammock), and is still light weight. It turns out that for me the Hammock thing works well. My base weight with the 2 lb Bearakade (bear cannister) runs around 12 lbs. I always have several cooking systems for testing reasons. Using the GossamerGear G5 pack and ground only sleeping system on the JMT in 2006 my base weight was under 10 lbs with Bear can. Lee: Well I could be in the ultralight group if I didn't like to party so much. I carry some luxury item like a stereo (1lb), large size thermorest (2 lb although Trail Designs just bought me a NeoAir at 19oz to try) and custom carbon fiber bow saw which pushes my base weight up to 18 lb. Much less now than the 40 lb base weight I had for 24 years. It has been a huge change in comfort even at 18 lb and I now love backpacking more every season. Russ' Kitchen Cone. He's been using it daily for over a year. Its noticeably faster then the open pot support. Trail Designs became famous with the Caldera Cone, which has reaped many awards in the press and among its users. Can you tell us a little bit about the beginnings of Trail Designs, the birth of the Caldera Cone, and how it developed over time? Rand: It all kind of started I struck up a long standing friendship with Russ Zandbergen when we were both working at Sun Microsystems. When we each independently found our way to Lightweight/Ultralight backpacking, we started to spend more time together discussing and developing designs to help ourselves in our various trips into the Sierra Nevada. 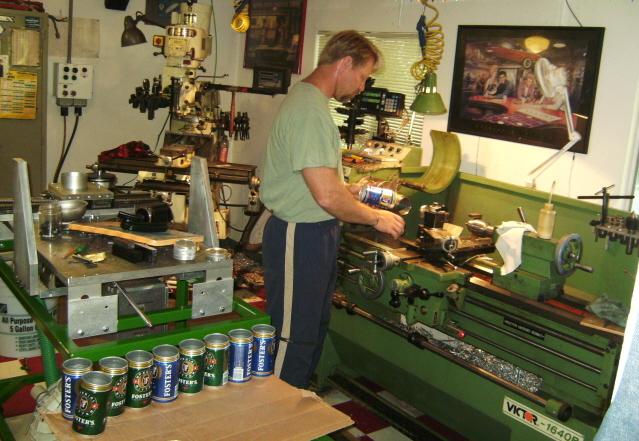 At the same time, Russ engaged his brother Lee, a Tooling Engineer, to develop and build machines to automate and streamline the production of the various designs. Around 2005, it became more obvious that we needed to incorporate and put up a website to see if anybody else might be interested in our ideas. Also around this time, we met George Andrews at AntiGravityGear. He has been an endless source of support for us and we often refer to him as the „Fifth Beatle“. Over time, the market has driven our designs toward ligher, more packable, more reliable, more versatile solutions. Russ: Trail Designs was born in 2005 when Lee, Rand and I decided we wanted to operate as an LLC. The seed that grew into this started when I bought my 1st alcohol stove on E-bay for $5, maybe late 2003. I started building systems based on really small diameter pots. At first it was all pressure stoves. The next interesting thing that happened was I saw an add by " AntiGravityGear". I was interested in getting a cozy for one of my tall skinny pots. I contacted them by mail and George offered to make me one if I sent him the pot. I got 2 different cozies back free of charge. I shared some early design ideas with George that got him very excited and we ended up talking more about that, which lead us to the making the Primer pan for Georges stove, our 1st product. I went to Trail Days in 2004 to meet George. By this time I had built the 1st incarnation of what would become the Caldera cone. I showed my 1st proto to George and some others and got mixed feedback. I stayed with it, always looking at the total system and fuel efficiency. 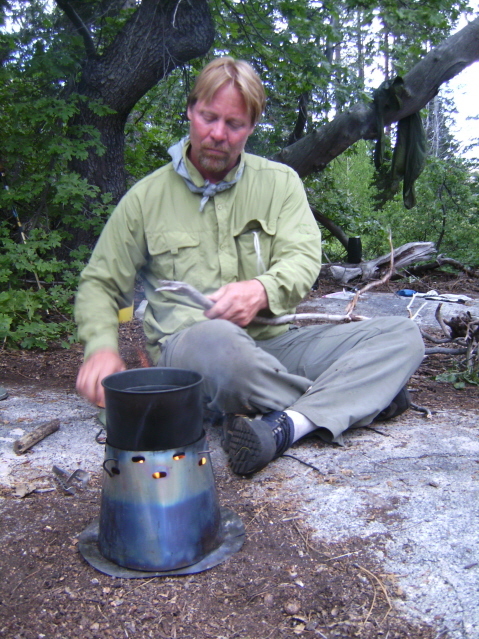 I was introduced to the center burn type stove (the Pika) by a Sierra club member. 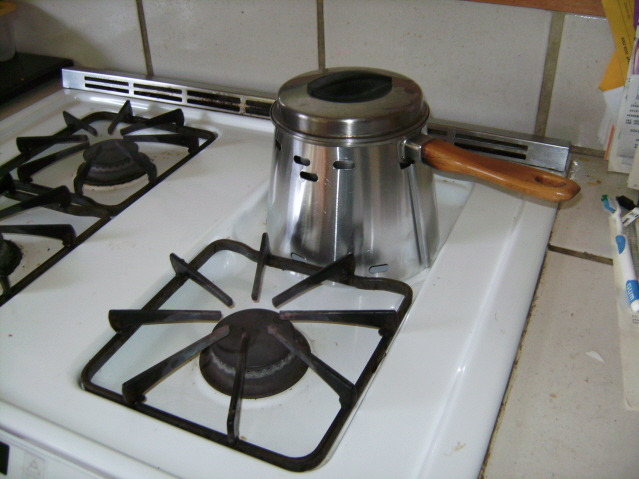 It turned out that this type of stove was much easier to tune in the cone and we eventually landed on the 12-10 burner after many more itterations including one called the "Caldera Cooker". When Lee stopped using the white gas rig and started using the cone I KNEW we really had something.... Big day for me to see Lee doing his cooking thing with a cone. Lee with an Agg 2 qt Ti-Tri at a small lake north of Yosemite, summer 2009. Lee: I can remember like it was yesterday. I was running up the canyon behind Lake Elanor in Yosemite. I was packing in heavy as usual including around 4 lbs of cooking gear. I would normally make water and cook for the group with a white gas rig. The first night out Russ brought some Alcohol stove he had made to cook with. Well, he fiddled with it for a long time and finally got some hot water. This just confirmed that somebody was going to have to pry that white gas rig from my cold dead hand, but watching him motor up the grades with that lighter pack did get me thinking. Russ kept trying. Every new trip he tested new designs and that has not stopped yet (8 years later)..... and I don't carry that white gas stove anymore. Rand, Lee and Russ, we love to be let in on the work-in-progress stuff! Can you let us know a tiny bit on what kind of new products we might be able to get in the future from Trail Designs? Russ: I'm going to follow Rand's lead here and keep the cards close on what we are working on. We have never really had a stereotypically formal "plan" set in concrete, it's always changing. The other morning I sat down and made a list of the separate development projects we could pursue. I came up with 9 projects. Some are related to each other to a degree, but the outcome could be maybe 5 different products. Engineering takes time. Sometimes it seems to me to be like letting fruit ripen, it takes what it takes. The prototype of the saw Lee is talking about below weighs in @ 18 grams. Lee: Well I can tell you we like to develope things we like to use. Now that I run a Ti-Tri with Inferno insert, I could use a sub 1-oz saw to go with it that really works. How works the R&D at Trail Designs, do you have a need yourself that you try to fix, or do some of your clients inspire you for new products or ask you for solutions to their problems? Rand: Obviously we tend toward products that solve problems for our camping needs, and that drives probably half of our design motivation. The other half does come from customer suggestions. For example, the early packability desires pushed us to the UL Compact, the Fissure and the Caddy. The early closure concerns pushed us to design the dovetail joint. And early customer testing also gave feedback that led us to bias the lower venting to one side to make more of a wind break. Russ: The DIY community has actually "guessed" our next move more then once. We will be working on something and someone will post it as a concept. There are some really sharp DIY guys out there. Like I have said, the development thing is influenced by lots of things. I do both OR shows. Sometimes I see things that I think I can use to solve problems. Sometimes a customer request, or another Cottage guy will spark something. Then we talk about it, and maybe go on to do some engineering/development work. Finding ideas to develop is not our problem. We have lot's to do right now. It's all great fun! Lee: Not much to add to Rand and Russ on that one. What is the most sold piece of gear from Trail Designs? Also, where do your customer come from? Rand: The most sold piece of gear from Trail Designs is the standard Caldera Cone..... however not by much! It is followed VERY close behind by the Primer Pan for alchohol stoves and then the 4" Classic Windscreen. As to customer base, the vast majority of our customers are in the United States, followed by the United Kingdom and then Germany. Does Trail Designs participate in fairs or happenings, like the Outdoor trade show in the USA or Germany, or other happenings? Rand: We have been attending the US Outdoor Retailer show consistently now for the past few years, but have not made it to Germany yet. We have also been attending Trail Days in Damascus Virginia since we've been in business and have made an appearance or two at the ADZPTCKO. Russ: The show's are a great time to meet up with folks, and see what's new. The Outdoor Retailer show is something to see, always something new and surprising there. I would like to make the show in Germany next Summer. Russ: I have 3 or 4 different packs I use, most from Gossamer Gear. I have a G5 in sil-nylon that I use for trail hiking with a can. A G6 for short overnights, and a Mariposa plus for the off trail adventures. I also use a pack called a "Gearskin" by a company called Moonbow, for large loads. I have a RAB zipperless sleeping bag I've converted to a quilt I really like. I'm a pertex junkie. I'm currently using a 48" Prolite 3 as a pad. Like Rand I use a Ti-Goat bivy. Lately my shelter has been an Oware spin tarp. Before that it was one of Henry Shires one man rigs. Cooking system varies. Usually it's a smallish (600mL) pot/cone system and a cozied zip lock to rehydrate in. Taking notes, bad hair day Russ doing data logging on summer off trail trip above Cherry Lake, North of Yosemite. When and where were your last longer backpacking trips, and what was your baseweight? Are you planning to get out for a trip soon, and enjoy the winter season in Yosemite National Park? Rand: Last long trip was a north to south attack on the John Muir Trail last year with a base weight of 15 pounds. Don't do so much winter camping in Yosemite.... mostly ski this time of year! 700 mL ti pot and cone, Evernew 400 mug and cone. Running Alcohol only, Cozies for both pot and mug. I hope to try to do the JMT this summer, maybe in July depending on the snow. Lee: 5 or 6 days have been my limit so far. Off trail most times. I hike in the winter and hope to get out next month for a few days. Rand: No…. I do not think that UL gear will break into the "mass" market. While I do believe it will become more popular, at the end of the day, it has an inherent limitation, and that is cost and durability. Lighter gear would naturally be preferred by any customer if given an equal choice, but their choice will rarely be equal. For one, as you get into lighter and more exotic materials (like titanium and carbon fiber for hard goods, and cuben fiber for sewn goods) prices tend to go up. As prices go up, your customer base starts to compromise on their natural preference for lighter gear and begins to consider heavier, less expensive gear. Further, there is a lot of ultralight gear on the market that, by the very nature of its ultralight construction, will never be as rugged and sturdy as some of the heavy weight "bomb proof" gear. Because of the VERY liberal return policy of some of the larger retail chains, they will never carry this gear because they can’t absorb the returns of these products when introduced into a customer base that isn’t trained in how to take care of this class of gear. Both of these drive the production, distribution and sales into the cottage industry where the thinner margins can be more easily absorbed. So, in summary, there will still be a market for inexpensive, heavy gear, and a retail distribution model geared up to support it. Lee: Well I think anybody that continues to hike into old age will lighten-up whether they want to or not. Lee and Rand at the last day of summer OR 2009. Are you cooperating "behind the scenes" with other cottage manufacturers? Are you for example in touch with any of the other cottage manufacturers, and talking about developments and the like? Rand: Absolutely! 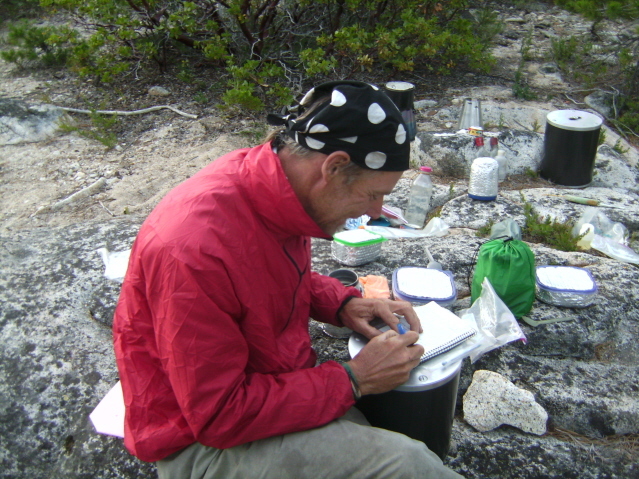 For example, we have a Caldera Keg that was specifically designed for Glen Van Peski at Gossamer Gear called the Caldera Keg-GVP. Also, we have been working closely with Titanium Goat on the Ti-Tri. We have a unique Caldera system that we paired up with Trail Cooking's pot. Mountain Laurel Designs assisted with the early version of the Caldera ULC. AntiGravityGear initially prompted the development of the windscreen and primer pan lines. So, yes, we do a lot of work with our cousins in the industry. Lee: It's great to work with the people who make the other gear that I use! Russ, Rand and Lee, I thank you for taking the time to answer my questions. Is there something you would like to add?